I have saved lot of pictures in my computer on Windows XP. Now I wish to locate some pictures, how can I search them using the name? Re: How to search for the pictures using file name in Windows XP? If you are looking out to search for the pictures in your Windows XP computer, then you will have to follow the below mentioned steps. This will search for the pictures that you have been looking for. 2.Click all files and folders on search utility. 3.Now, enter picture names that are present in your computer. If you have named your picture folders properly you should be able to find them quickly. Enter something like: bday, birthday, grandma, yosemite, or other events or places of interest. You can also enter part of a word (i.e. grand, year, birth, and day) and the search utility will find what you’re looking for. Click the Start button then click Search. The Search window will open. On the left of the Search window is the Search Companion. In the Search Companion, click All Files or Folders. You can search for files or folders by the file name , a word or phrase in the file, the drive where the file is saved, or any combination of the three. By default, Search Companion will look through your hard drive. If you want to search a different drive, click the down arrow below Look in. This will bring up a list of the drives, folders, and disks you can search. Click on the drive, folder, or disk you wish to search. If you want to refine your search, click the arrow next to More Advanced Options. If you know what kind of file you are looking for, click the down arrow under Type of File. A long list of file types will appear. You will see a summary of your search criteria as Windows looks for your file. When Windows finishes your search, you will see all of the files that meet your search criteria on the right side of the Search window. Click all files and folders on search utility. Now, enter picture names that are present in your computer. It is very easy to search a file by the image name. There are many types of search options given in the windows search to make it easy for the user to search. First of all open the search option in the system. Now what happens in this option is that the computer to shorten the search time only searches those files which have the image type extension. So by this the time taken is reduced. After you have selected the option you can type the image name on the search box. And do the search . Now if you want to enhance the search option. Than go to advanced search and in that you can also specify the drive name in which you want to search. By this your search will be narrow your search. Searching the entire computer in one go. Since searching each folder one by one will tedious and time consuming task i will discuss the later one. 1.click on start and then choose the search utility option. 2.In the box that appears choose Click All Files and Folders. 3.In the “All or part of the file name” enter the entire name or some words of the name of the file. 4.In the “Look in” field select my computers as you don't know the location of your files. 5.Click OK and the search utility will find your file and you can then know its location. To do this just click on the start button and click on search. On the left side of screen an option will show you that "What do you want to search." In this column choose Pictures, music or video. Now type the name of the picture file which you want to search and do not forget to mention the search criteria as in which drive you want to search that object. As select My Computer to search the file because it will search all the drives related to the computer. Its easy to search the pictures. in the window that appears select the files and folders option . Hit on Search option under Start Button. Now select pictures,music or video in left pane on search results. You can also enter the file name of the pictures that you stored. It will search all pictures that are avail in your pc and provides you. Now you can select the picture that you want. 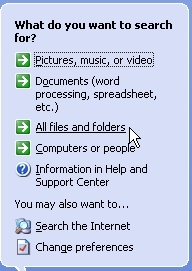 To search a particular file or a folder in windows xp make use of the search option which is available in the start menu . When you open start menu you can find the Search option. Type in the file name you need to search and press enter. In fraction of time the result will be show . The result shows the location of the file where is it . Based on the link you can find the location of the file on your system. That`s it by doing so you can find the file you want . Just go to [FONT=Courier New]Start --> Search --> For Files or Folders[/FONT]. Follow these steps: 1.Open START>SEARCH>FILES OR FOLDERS. 2.Click all files and folders on search utility. 3.Now, enter picture names that are present in your computer. ALL THE BEST!!!!! Your Searching Keys related List will be Displayed. step 1 :- click "start" -> "search"
Click on the My Computer of the Desktop. Then, press F3 button for Search. If you know name, enter the name and press Search button. Explorer will start searching. If your desired file is found. It will displayed as results. Yes you can search for pictures using file name in windows XP. Just fallow the steps given below. -->Then in the computer folder on the top you will find search option just click on that. -->In the search option you will find different options. -->In that you can select the folder type name and size of it. -->Then you can find the what you need. It's quite easy to search for a photo from a large set of image in windows XP . Open the folder where you have saved all your photos . Now , as you want to have a particular photo you can easilyu locate it by knowing the first alphabet of the name of the image . When you have opened the location of that particular image , press a key in the keyboard that starts from that is the first alphabet of the image name . For example : If the file name is " Enrique " then press the key ' E ' in the keyboard . 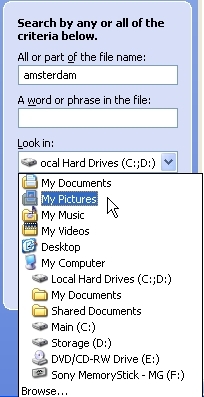 By doing so you will directly reach to all those files(images) starting with the entered alphabet . This would certainly help you in searching a particular file from large numbers of files in a same folder or disk . 1. Start --> Search --> For Files or Folders. 2. 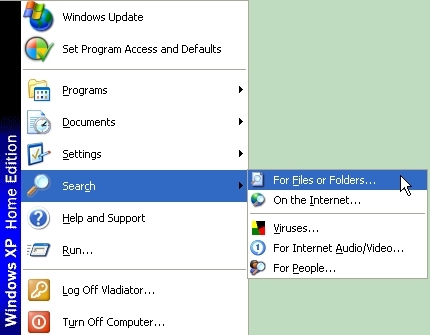 Click All Files and Folders on the Search Utility screen. A few simple steps will take you to your desired picture or to any other files you want to see. A intensive search will be done by the system and if found it will show you the list and where exactly the files are located. Dear to find a file or folder you have simple steps to do in window XP. :: click on the start button. :: select search option from here. :: now select file and folder . :: write the name of file or folder which you want to search and press enter. :: A list of file and folders appears select the file which you want to search. 3)search for FILES OR FOLDERS. 4)now Click on 'All Files and Folders ' on the Search Utility screen. In the Advanced option there are option of hidden file or size of file. And Click on the search option your picture will be search in Explorer. 1.just open my computer and click search option at the top of that my computer window. 2.and in that you can see some options..........select pictures music or video. 3.and then it will display that a search box in that box you can type your picture name and then click on the search button. 7. lastly, click on the box written as 'search'. you'll find the searched results that you are looking for. > You can search by "Typing the file name" . If you don't know the file name "Type any key in file name" . > Select the "Drive" in which file is saved and click "Search"
If you're searching to look for the photographs in your Windows XP pc, then you may ought to follow the below mentioned steps. This will explore for the photographs that you just are yearning for. Start --&gt; Search --&gt; For Files or Folders. If you've got named your folders with enough details you must be ready to find them terribly quickly mistreatment the Search capability that Windows includes by default. You don’t would like any special program to put in or learn, you utilize solely what comes with Windows on your computer. STEP 3: Enter parameters for looking. ensure you decide on My photos (or your photos folder) within the “Look in” field. Otherwise it'll search your entire pc. within the “All or a part of the file name” field enter the event or place you’re yearning for. If you've got named your image folders properly you must be ready to realize them quickly. Enter one thing like: bday, birthday, grandma, yosemite, or different events or places of interest. you'll be able to conjointly enter a part of a word (i.e. grand, year, birth, and day) and also the search utility can realize what you’re yearning for. Click the beginning button then click Search. The Search window can open. On the left of the Search window is that the Search Companion. You can explore for files or folders by the file name , a word or phrase within the file, the drive wherever the file is saved, or any combination of the 3. By default, Search Companion can glance through your drive. If you would like to look a distinct drive, click the down arrow below Look in. This will point out a listing of the drives, folders, and disks you'll be able to search. Click on the drive, folder, or disk you want to look. If you would like to refine your search, click the arrow next to a lot of Advanced choices. If you recognize what quite file you're yearning for, click the down arrow underneath style of File. A long list of file varieties can seem. You will see a outline of your search criteria as Windows appearance for your file. When Windows finishes your search, you may see all of the files that meet your search criteria on the correct facet of the Search window. 1.Firstly go to the desktop and click on 'Start menu'. 2.Then you c;lick on the 'Search' and a new dialog box will appear. 3.Then you click on 'Picture,Music,or Video'. 4.Then you make a tick mark to 'Pictures and Photos'. 5.Then you type the name of the picture. 6.At last you click on the option 'Search'. Yeah! I have got your problem and i have the solution for it. It's very easy and just 5 steps procedure. i.You open the :search; box. ii.Now you press on icture,music or video:. iv.And type the name of the picture. v.Now click :search: for start searching. Every operating system have search option to search all type of file, folder, videos or mp3 file.. etc. You can easily search pictures by file name in Xp. If you have named your folders with enough details you should be able to locate them very quickly using the Search capability that Windows includes by default. You don’t need any special program to install or learn, you use only what comes with Windows on your PC. The following is the procedure for solving the problem of search for the pictures using file name in Windows XP. Then tap on to the search option. Now the files and folders are to be finded out. There in the search utilities,the 'all files and folders' option is to be selected. After that the names of the pictures are to be entered which are stored in your system. Then press the search option. 1.please turn on your computer and open start menu. 2.now click on the search. 3.now click on option "pictures,music,or video" in left side. 4.now check on pictures and photos checkbox. 5.type your file name and press search option. 6.wait few seconds and see results on right side. i hope you will find your file.